Everyone needs more exercise to help them stay healthy and fit. While rigorous exercise is ideal, you can still burn calories and lose weight by simply walking. Walk at a moderate pace for 30 to 60 minutes and you can both build muscle and burn stored fat. And by building muscle, you are increasing your base metabolism because even when you are at rest, your muscles are burning calories. If you have more muscle, you are burning more calories all the time – even when you are sleeping! In addition to losing weight, studies have also shown other important health benefits of walking, including decrease your risks of heart disease, colon cancer, diabetes, breast cancer, and stroke. As a rule of thumb, a 180 pound person burns about 100 calories per mile when walking. To boost your workout and burn some extra calories with every stride, use these tips for maximize your walking for weight loss. 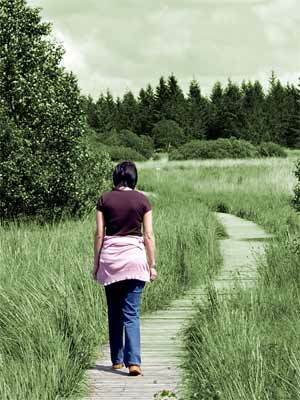 Walking on uneven ground can boost your calorie burn by up to 80%! So get off the sidewalks and pavement and find an uneven path or trail. As an added benefit, you will also improve your balance. But be careful – make sure you are walking in a safe area and that you have enough balance to keep from falling. Walking up an incline can boost your calorie burn by 50%. If you are walking outside, try to plan your walk so that you spend half your time going uphill. If there are no hills, try to find some stairs. If you are on a treadmill, simply adjust the incline – we recommend a 5% incline. You can burn 25% more calories when walking by simply swinging your same arm and leg in sync. What does that mean? Well, normally when you walk you swing your left arm in sync with right like, and vice versa. Instead, you should swing your right arm and right leg at the same time and in sync. This might sound easy, but it takes a little effort to pull it off. And while you might look a little funny, it’s worth it according to a recent study from the University of Michigan at Ann Arbor.